A Neo-Nazi Skinhead is charged with murder, and Legal Aid has assigned him a Jewish lawyer. Over the course of developing a defense for the Skinhead, the lawyer is forced to examine the limits of his own liberalism, and the demons underlying it. Dan Jeannotte is a Montreal-born actor and improviser. His credits include The Real Inspector Hound (MainLine Theatre), Dracula (Fallen Angel Productions),Hedda Gabler (MainLine), As You Like It (Pumpkin Theatre), Legend Of The Barbarian (Two By Four Productions), Vampire Lesbians Of Sodom(MainLine) and Peccadilloes (Whip Theatre). Dan is a founding member of award-winning comedy troupe Uncalled For – improv veterans, creators of the scripted shows THUNDERSPANK! (Best Text Award, 2007 Montreal Fringe) and Blastback Babyzap (Just For Laughs Best Comedy Award, 2008 Montreal Fringe) and producers/hosts of the Fringe's late-night variety show/dance party The 13th Hour. His recent screen credits include CBC's Sophie, Paul W.S. Anderson's Death Race and the upcoming Tom Fennario short film Washed In Blue. Sean is originally from Winnipeg, where he was an active participant in theatre, film and television work. He was educated and trained at the University of Manitoba, the University of Alberta and York University. After having lived and worked across Canada, in 2001 he moved to Montreal to teach Drama and Theatre to students at McGill University, where he is currently an Associate Professor. In addition to his own acting work, he particularly enjoys directing student actors in productions at the Moyse Hall Theatre on McGill's campus. Personal acting highlights include the lead role in the independent feature film Black as Hell, Strong as Death, Sweet as Love (director Caelum Vatnsdal). Recent directing highlights include Playhouse Creatures by April De Angelis and Shakespeare'sTwelfth Night. 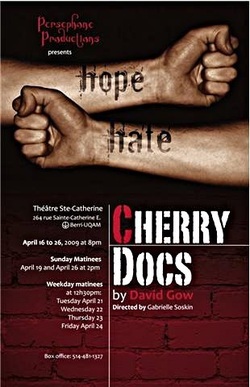 Sean considers David Gow's Cherry Docs to be one of the best Canadian plays he has ever read. He's humbled to be playing the role of Danny Dunkelman and to be working with such a talented group of artists and technicians. Upon graduating from John Abbott's Professional theatre acting program, Heidi has had the opportunity to work with various local theatre companies. Most recently she appeared as Felicity Cunningham in Tom Stoppard's The Real Inspector Hound. Heidi's favorite acting roles include Celia in Pumpkin Theatre's As You Like it, Erika in Persephone's own Suburbia, and Jen in White Raven's Sunday On the Rocks. She is excited to make her assistant directorial debut withCherry Docs, and is thrilled to be mentored by the wonderful Miss Soskin. 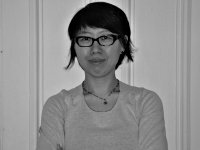 Born and raised in Seoul, Korea, Mee graduated with a BFA in Design for the Theatre from Concordia University and completed the Theatre Production Internship at the Segal Centre under the direction of Norberts Muncs. Credits include: Co-Set Designer and Lighting Designer on The Vipers' Brood (Concordia University), Assistant Set Designer on The Importance of Being Earnest (High Resolution Productions), Assistant Lighting Designer for the Festival de la musique traditionelle La Virée in Gaspé, The Nutcracker (Ballet Ouest de Montréal), Houdini (The Segal Centre), The Mystery of Meddy Heisler (Centaur Theatre),The Odd Couple (The Segal Centre), Lighting Designer on Keeping your eyes gently Closed quarters (FASA-Concordia University). A graduate of Concordia University, with a BFA in Playwriting, Cherry Docs is Mary's second production with Persephone, having Stage Managed Othello this past winter. Recently she did a contract as a Stage Staff on the Royal Caribbean ship 'Splendour of the Seas' in South America & the Mediterranean, working on numerous shows, including production shows Ballroom Fever & Dancin' Thru the Movies. 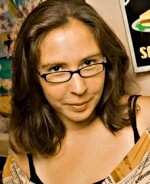 Credits include: Assistant Stage Manager on Richard III in Bouffonwith Company of Fools (Mainline & Arts Court, Montreal & Ottawa); Stage Manager on One Night with Tableau D'Hôte Theatre (Studio Hydro-Quebec, Montreal); Assistant Director on The Queens with Concordia Theatre and Emma Tibaldo (Cazalet); Director of Wake, 7:35, The Presentation with Concordia Theatre (Ten Minute Play Festival 2007, TJ Black Box, mentored by Sarah Stanley); and Assistant Stage Manager on At The Crossroads & Caucasian Chalk Circle with Concordia Theatre (D.B. Clarke). Although immersed in the theatre milieu, Melissa's background is actually in music. She has a DEC in Music (classical piano) from Vanier College and an Honours B.A. in Arts Management and Music History from the University of Toronto. She has worked, in an administrative role, at the Milk International Children's Arts Festival (Toronto), the Canadian Conference of the Arts (Ottawa) and John Lambert & Assoc. (Montreal). At university she has played the piano for such productions as Godspell and the Three Penny Opera. Since the birth of her daughter in 2005, she has been working freelance for theatre companies in the Montreal area.